As I wrote on the last version of this page, it's all change on the vehicles front again for route 166 – but this time they are not cast-offs from route 319! The 166 has at last got its own new buses, in connection with a new contract which started on 30 August 2008, though the buses were several months late arriving. Two views are provided here of the new stock, first up being ENL28 (LJ58 AUC) on a service to Epsom taken in Outwood Lane, Chipstead, on 4 March 2009, which was the first day these latest arrivals worked the route. A further view shows ENL29 (LJ58 AUE) in West Croydon Bus Station on 11 March, exactly one week later. Croydon garage, which runs the 166, already had similar vehicles for route T31, and some of these had previously appeared as stray workings. As hinted earlier, the route has had several bus type changes over the years as it received buses displaced from other routes. The first such cast-offs were LDR class high floor Dart/Pointers which had converted the 319 to single deck operation in 1996, but it was decided to upgrade the 319 to DDL class low floor Darts in 1998 to match those on the 345. The bulk of the redundant standard floor Darts moved to Croydon for the 412, and, in the event, 166. In 2001 those DDLs were replaced on the 319 by higher quality DWL class Cadets, and history repeated itself by sending the displaced DDLs to Croydon garage for the 166 and 412! In late 2002, single door vehicles redundant from the 34 were cascaded across, allowing the dual door versions to move onto the 255 where the exit door is probably more useful. Single door vehicles of this size are now something of a rarity in London, but the layout makes sense on the substantial rural section of the route between Coulsdon and Epsom, where centre exits can cause problems with passengers disembarking onto grassy verges. Still, the dual doors could be useful on the busier section between Coulsdon and Croydon. Notwithstanding the grassy verge problem the single door vehicles were wanted for sale to other parts of Arriva, and re-double-decking of route 319 predictably saw a vehicle cascade again, and although the 412 is now itself double deck, the 166 was in the firing line for some of the DWLs mentioned above. DWL 1 (Y801 DGT), numerically the first of the fleet, is seen at Chipstead Valley Road, Coulsdon, having just crossed the Greater London/Surrey border on the first day of the class on route 166, 16 September 2006. These buses have actually now moved to Thornton Heath garage for route 255 replacing the DDLs (! ), but the photo has been retained as it is a nice view. The ENLs are, in practice, mixed to some extent with ADL class Darts on the 407 and PDL class Darts on the 312. Illustrating these latter in another refreshingly un-London-like view is PDL 117 (LJ05 GOP) at the Rising Sun in Chipstead on 26 September 2005, just along the road from the first photo; this was traditionally the terminus of the route, but now all journeys run at least as far as Banstead. 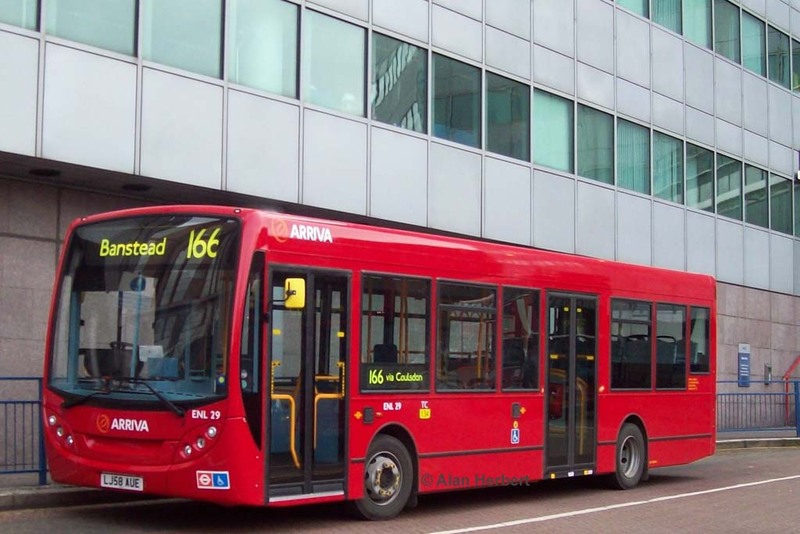 The 166 is an unusual route for London Buses, running through suburban London from Croydon out to Chipstead, then passing through semi-rural north Surrey via Woodmansterne, Banstead and Epsom Downs to Epsom, to terminate at the Hospital. 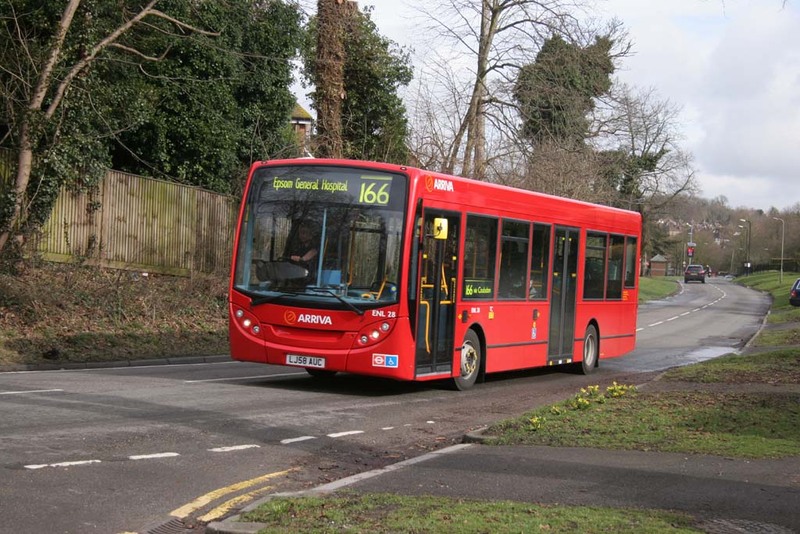 166 is now the lowest route number to be found in the Epsom area, most routes still being numbered in London Country style with 4xx series numbers or with more modern letter prefixes. 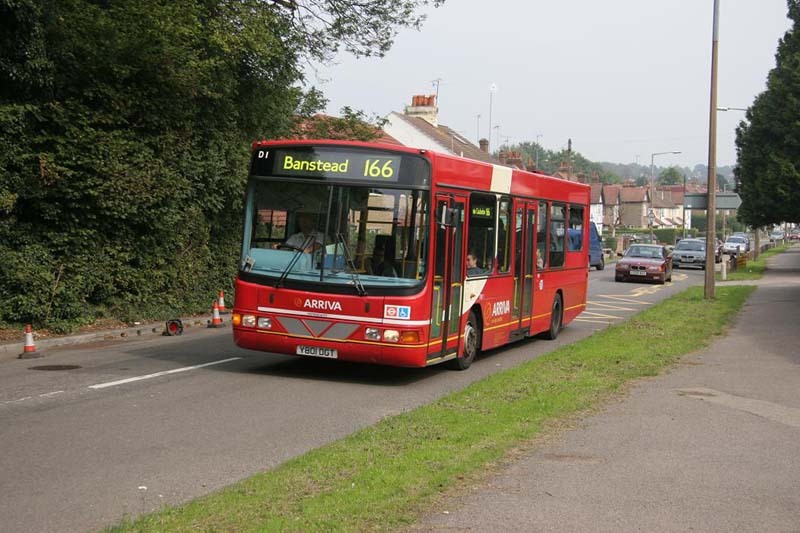 However, it is not the first low number in the area, as for many years the link between Banstead and Epsom was covered by route 164, a route which still exists in much-modified form today. This followed a more direct route, missing out the deviation via Epsom Downs station. Meanwhile, the first public transport to rural Woodmansterne appears to have been a service by Banstead Coaches, operating between Chipstead Valley and Banstead Station. I presume it was deregulation in the 1980s that resulted in the 164 being cut back to Belmont (it now only gets as far as Sutton), and Surrey County Council provided route 598 between Epsom (The Wells) and Croydon, via almost exactly the current 166 roads. Operation was by Epsom Buses. Route number 498 appeared from the July 1992 map, presumably representing journeys now run commercially by Epsom Buses rather than on Surrey Council contract. The precise routeing in the Epsom area has changed several times, and for several years the 498 ran to the cluster of hospitals west of Epsom. The 598 disappeared for a while, then returned as a Sunday service running into Sutton rather than Croydon, then disappeared again. By 1996 the Epsom area routeing had been standardised to run as far as Epsom, with the service to The Wells now covered by local route E5, and that to the housing built on the now-closed hospitals the E9 and K9. Meanwhile, London Transport route 166 provided an additional service between Chipstead Valley and Croydon, but as part of the preparatory bus changes for Croydon Tramlink it was proposed to withdraw the 166 from Chipstead Valley and divert it to Caterham-on-the-Hill. To maintain the frequency to Chipstead Valley, route 412 was to be extended from Purley, but this operates via a very indirect route via Selsdon. This would have left the hourly 498 as the only direct service from Chipstead Valley to Croydon, with no evening or Sunday service. Many protests flooded in from the residents of Chipstead Valley, and for once LT actually listened. The 412 extension was cancelled, and the buses thus saved were put into providing a more frequent service on the 498 between Chipstead Valley and Croydon. Arriva provided two buses per hour, with the timetables co-ordinated to provide a regular 20 minute service between Chipstead Valley and Croydon, though this is still a reduction on the 15-minute frequency previously operated on the 166 alone. To maintain tradition, the 498 was renumbered 166, and the diverted 166 became the 466 instead. The 166 number was chosen because the main service between Chipstead Valley and Croydon has traditionally been numbered 166. This number first appeared soon after World War II, running between Chipstead Valley and Streatham Common on Mondays to Saturdays via a large chunk of present day route 60. In the mid-1950s it was diverted at Thornton Heath Pond to Thornton Heath High Street, one of an increasing number of routes to follow this alignment. But by 1990 it had been diverted to Shirley (Monks Orchard Road). It was subsequently diverted to provide the service along Shirley Way, but the Summer 1998 Tramlink fiddle saw it cut back to Shirley Library, diverted to Caterham-on-the-Hill (replacing route 400) and, in the event, renumbered 466. Arriva had won the contract for the 412, and thus its buses were introduced to the 166 alongside Epsom Buses. Both operators used 9.8m Dennis Darts on the route, although for a while Arriva had to substitute a number of double deckers. However, following a recent trend on the fringes of Greater London, Epsom Buses decided to give up commercial operation on the 166, and consequently the whole route was absorbed into the London Buses network from 28 July 2001. London Buses fare scales were introduced, and the whole service was taken over by Arriva London South, giving the company its first proper taste of country bus operation (apart from the 403, 407 and 466 which only ran short distances beyond the fringes of Greater London, remaining within the built-up area). 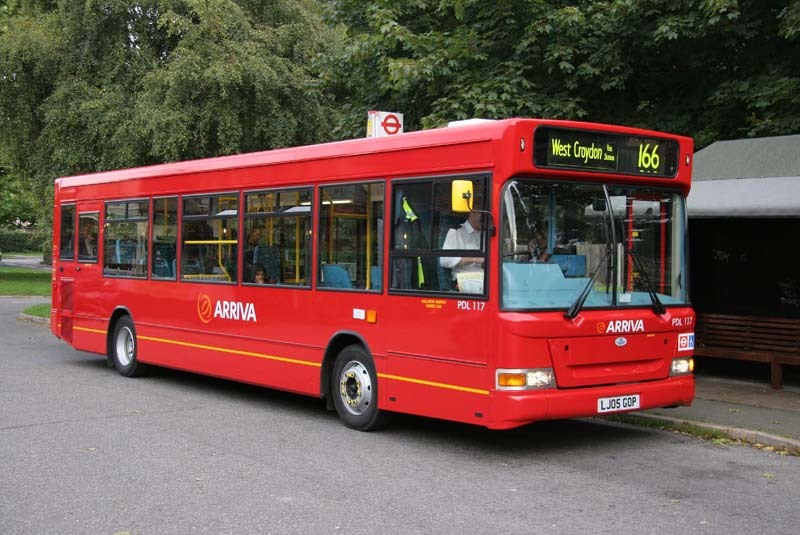 Additional 9.8m Darts were drafted in from Arriva London North route 307, which was gaining double deckers. The photographer has kindly summarised the vehicle types used on the route over the years, in order of first recorded appearance: DMS (until March 1992), M (4/85), LS (6/86, apart from one isolated appearance in 8/83), L (2/87), T (11/91), LDR (9/98), DRL (9/00), DLA (5/01), DDL (9/01), ADL (1/03), DPP (4/03), PDL (9/05) and DWL (9/06). Of course, we can add ENLs, possibly from 05/07, though I do not have a date. Of course not all were scheduled, and many types overlapped and ran concurrently, and Ms having first been used (when new) until December 1985 re-appeared after a gap of twelve years in November 1997.